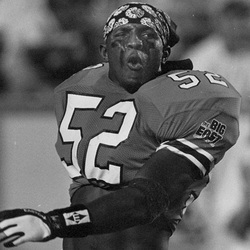 One of the most intimidating Hurricanes ever, Ray Lewis's dominating field presence changed the way teams prepared to play the 'Canes. His punishing abilities as linebacker made opposing coaches draw up special plays to try and contain him, while their teams' QB and running backs were always nervously looking for #52. Starting as a true freshman, the Bartow, FL native racked up awe-inspiring numbers and a bevy of honors in his three-year Miami career. Lewis holds the UM individual season record for tackles by a MLB with 95, and incredibly is tied for second in career total tackles and assists with 160. He was named All BIG-EAST in 1994 and 1995 as well. Not bad for someone who only played three years, and was the recipient of the very last scholarship available in 1993. Voted the Jack Harding MVP of the team after the 1995 season, Lewis opted for the NFL draft and became a first-round pick of the Baltimore Ravens. Now preparing for his 11th NFL season with Baltimore, Lewis has racked up over 1000 solo tackles, 258 assists, 23 sacks, 71 pass deflections, and 21 interceptions. Lewis was also the NFL's defensive player of the year in 2000 and was named MVP of Super Bowl XXXV, leading the Ravens to their first-ever world championship. Lewis remains beloved both in Baltimore and Florida for his commitment not only to being a great football player but his deep involvement in community enrichment. He regularly donates of his time and money to a variety of worthy causes, among them "Ray's Summer Days", which raises money for his non-profit foundation. After earning his degree Lewis put it to work, starting several successful business ventures, including a nutrition product line and a popular barbecue restaurant in Baltimore. A man who feels 'completely blessed' to be part of the Hurricanes rich football history, Lewis will go down as one of the best to ever play for the 'U'. Ray Lewis was inducted into the Pro Football Hall of Fame in Canton, Ohio on August 4, 2018 becoming the seventh Hurricane to be inducted.